JEFFERSON- This year marked the 59th year of the performance Diamond Bessie Murder Trial written by Mrs. Lawton Riley. 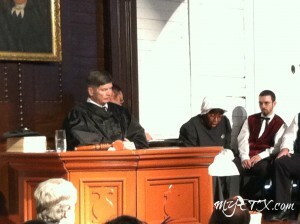 Over the weekend locals performed the trial re-enactment at the Historic Jefferson Playhouse. Every year most of the same citizens of Jefferson perform in the murder trial, with some having performed in the trial for over 20 years. This year Becky Palmer, a student from ETBU, played the ghost of Diamond Bessie and wowed audiences with her angelic voice. Other stellar performances include Zillary Easter’s portrayal of Jeannie Simpson, Jack Rasberry in the role of Justice Bankstead , Bruce Abraham as Prosecuting Attorney George Todd, Charlie Horn as Morellie, Mitchell Whitington as Sheriff John Vines, and Brooke Bradley who played the role of Isabelle Gouldy. The entire cast of the Diamond Bessie Murder Trial was impressive and full of energy and passion. We highly recommend adding the Diamond Bessie Murder Trial to your East Texas Bucket List of must-see shows and events. The Jefferson Playhouse is a historical gem capable of transporting you back to the days when Jefferson was a busy riverport city. Stepping foot into the old playhouse transports you immediately back to days gone by, making it the perfect place for the Diamond Bessie Murder Trial performance. The Diamond Bessie Murder Trial is performed each year on the first weekend of May, during the Annual Historic Jefferson Pilgrimage. January 19, 1877, a well-dressed man and a beautiful woman stepped off a train in Jefferson. They called themselves “A. Monroe and wife” upon registering at the Brooks House. The events that were set in motion once the strangers set foot in Jefferson led to the first big-name trial in Texas. Monroe’s real name was Abraham Rothschild. He was the son of Meyer Rothschild, a Cincinnati jeweler. Rothschild was a traveling jewelry salesman for his father’s company. Rothschild met Bessie Moore at a brothel in Hot Springs, Arkansas several years prior to their fateful trip to Jefferson. Moore was born Annie Stone, the daughter of a successful shoe dealer in Syracuse, New York. She became the mistress of a man whose last name was Moore, and although their association fizzled quickly she kept his name. Some articles written after her untimely death suggest she was a prostitute in Cincinnati, New Orleans, and Hot Springs before meeting Rothschild. Rothschild and Moore traveled together as husband and wife, however, there is no evidence to suggest the couple was ever married. Rothschild lavished her with diamonds, which only made Bessie stand out more. On the Sunday morning after their arrival and stay at the Brooks House, Rothschild purchased two lunches from Henrique’s Restaurant for a picnic lunch with Moore. The couple was last seen strolling together across the footbridge over the Big Cypress Creek. That afternoon Rothschild returned to town alone and went about his business. Locals inquired about his companion upon his return to town alone, to which Rothschild explained she was visiting with friends in the country and would join him again on Tuesday. However, when Tuesday came Rothschild left town alone with both of their luggage. Bad weather set in, bringing snow to Jefferson for about a week after Rothschild’s departure. When the temperature began to warm a woman by the name of Sarah King went out to gather firewood. While searching for wood King discovered a well-dressed woman’s body near a twisted oak tree. There were remnants of a picnic lunch near the body, but there were no diamonds to be found. The coroner ruled that the woman had died due to a gunshot wound to the head. Locals took up a collection and buried the unidentified body at Oakwood Cemetery. A warrant was issued for “A. Monroe” for suspicion of murder. Later local officials learned that “A. Monroe and wife” had registered in Marshall as A. Rothschild and wife from Cincinnati, Ohio, and a new warrant was issued and the victim was identified as Bessie Moore. While in Cincinatti, Rothschild became paranoid and attempted suicide. He only succeeded in blinding his right eye. He was arrested in the hospital and Texas and Marion County officials were sent to Cincinnati in order to identify and extradite him. 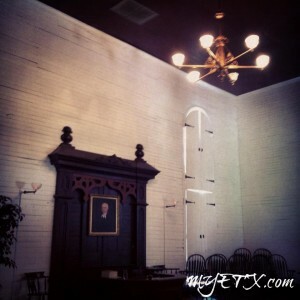 The trial became notorious and most East Texas lawyers attempted to be involved on some level, either on the side of the state for prestige or on the defense for the money to be provided by the Rothschilds. The defense had an impressive array of legal talent including a future governor of Texas, Charles A Culberson and a United States Senator, David B. Culberson, among other legal minds who undoubtedly were paid very well for their efforts. The first trial began in December of 1878. The legal battle lasted two-and-a-half years. After three weeks of testimony the jury found Rothschild guilt of murder in t he first degree and sentenced him to a hanging death. The defense appealed for reversal of the case on the grounds that the trial had been unfair, and the judge declared a mistrial. December 2, 1880, the state issued another indictment against Rothschild, and the second trial began on December 14, in Jefferson. By December 30, 1880, the jury had found Rothschild not guilty. Rumors about the trial swirled in Jefferson, and eventually became part of the local folklore surrounding the trial. Stories of twelve $1000 bills being lowered into the courtroom during deliberations buzzed through the community. And some say that all twelve jurors met untimely and violent deaths within a year after the trial. Others say Bessie was pregnant at the time of her murder, however, that was never proven. 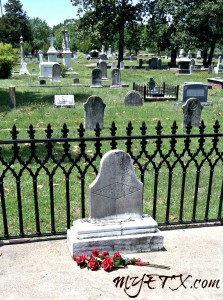 Some time in the 1890’s, a well-dressed, elderly man wearing a patch over his right eye showed up in Jefferson seeking the grave of Bessie Moore. When shown the grave, he laid roses near the tombstone, prayed, then commended the locals on their goodness and for providing a decent burial. Local lore suggests this one-eyed elderly stranger was a repentant Rothschild. In the 1930s a headstone mysteriously appeared on the grave where none had been before, and in the 1960s the Jessie Allen Wise Garden Club built an iron fence around the grave. In 1941, E. B. McDonald admitted putting up the headstone because it had not seemed right for Diamond Bessie to rest in an unmarked grave. Thus ended at least one mystery surrounding the case. The case, still officially listed as unsolved, attracts many investigators and lawyers to this day. Since 1955 a courtroom drama relating the story has been presented each spring as part of the Jefferson Historic Pilgrimage. Usually my Tuesday’s are pretty uneventful and mainly consist of social media updates, answering e-mails, ad design and meeting with our local stakeholders. 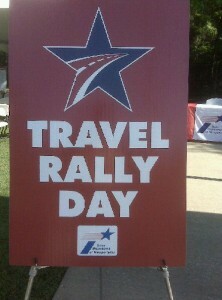 This past Tuesday was a little different than the norm as we had two big events; The Texas Travel Day Rally at the I-20 Texas Welcome Center in Waskom, Texas and a Texas Historical Commission Preservation Workshop here at the Jefferson Transportation & Visitor Center. TYLER- With a name like “What About Kabob” you can’t help but wonder, “What about it?” MYETX usually looks for southern-style diners and dives on the road, but this time we decided to try something untraditional in East Texas. While the Pineywoods is not known for serving up Greek dishes, What About Kabob in Tyler proved to be a rare gyro-gem that we can’t wait to visit again! GALVESTON- Over the weekend our team visited Galveston Island to take part in the third largest Mardi Gras celebration in the United States. 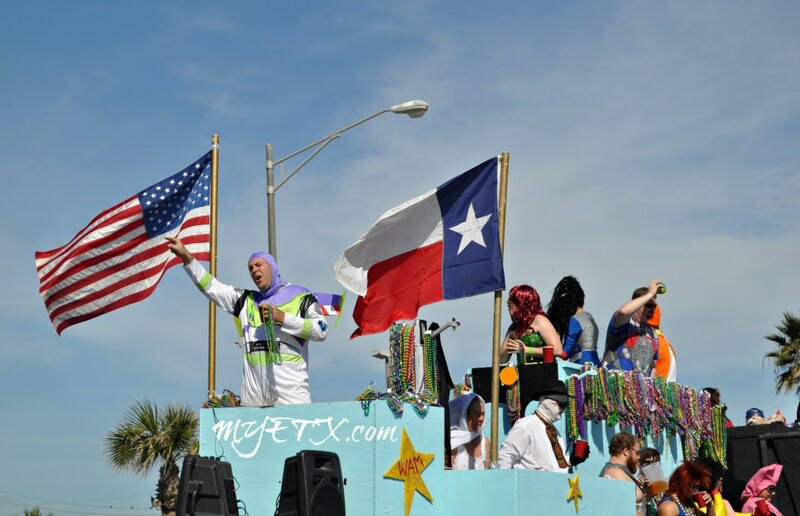 Mardi Gras was in full swing on the Island this weekend.